Image caption Karamba (left) was put to sleep because she was so badly "ripped apart"
Hunt hounds "viciously attacked" a herd of alpacas, leaving one so badly "ripped apart" she had to be put down, prompting a police investigation. Langley Alpacas in Derbyshire said another of its animals was recovering from numerous wounds he suffered in the attack. The hounds were from the Meynell and South Staffordshire Hunt, which was hunting nearby on Tuesday. The hunt has apologised and said incidents like this were "very rare". Angela Andersen, from the alpaca farm, said she was "devastated" when Karamba had to be put to sleep. "She was pretty much ripped apart on her back end," said Mrs Andersen. "Her injuries were pretty horrendous, pretty vicious. "They were just too bad that there was nothing they could do for her really so we decided that was the best thing to do." 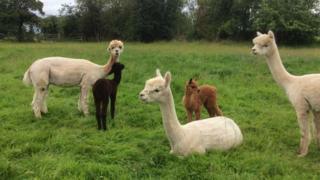 Mrs Andersen wants other alpaca owners to be aware of what happened. "I'm on an online alpaca chat group and I think countrywide this isn't the first instance of anything like this," she said. The Meynell and South Staffordshire Hunt told the BBC it had been "trail-hunting within the law" when some hounds "unexpectedly entered the grounds of Langley Alpacas". It said in a statement: "The hounds were removed as quickly as possible and representatives from the hunt continue to liaise with the owners of the herd. "Thankfully incidents such as this are a very rare occurrence but in the event of any concerns as a result of our hunting activities we always endeavour to deal with them as promptly as possible." Derbyshire Constabulary said it received reports of "dogs worrying livestock" and officers were investigating.